On the 27th of May, the Tibet Foundation, a registered charity in England, led by Tibetans for Tibetans, celebrated the 19th anniversary since the founding of Samten Kyil. The Tibetan Peace Garden, as it is known, is a public space used by both the Tibetans in UK and the local residents, often to relax and “meditate and feel at peace with the world” according to two local women walking in the Garden. 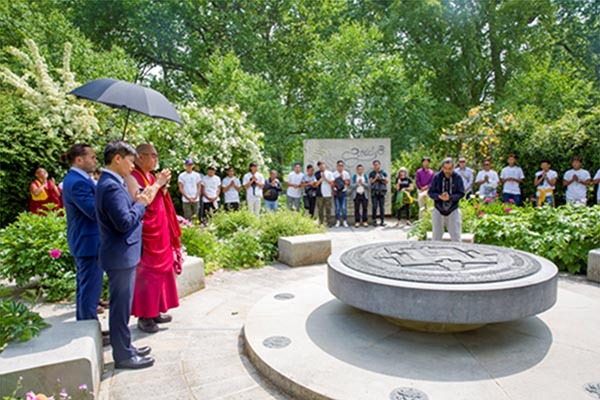 Since its commissioning by the Tibet Foundation and blessing by His Holiness the Dalai Lama in May 1999, the Garden has served as a place of natural beauty and a symbolic counterbalance to the ‘Imperial War Museum’ of London, next to which it is situated. The anniversary today had particular significance as it also welcomed the Tibetan National Football Team to the UK for the 2018 CONIFA World Cup, in which Team Tibet will play matches at an international level. Auspiciously, the usually temperamental British weather shone brightly for the Team Tibet. The ceremony was blessed by Drogon Gangri Karma Rinpoche of Martsang Kagyu London Centre, who performed traditional rituals within the symbolic enclosures of the Four Noble Truths Pillars, praying for the luck and success of the team. In his address to the gathering of friends, well-wishers, and supporters, Dhondup Samten, Executive Director of the Tibet Foundation, highlighted the uniqueness of Samten Kyil as a fusion of contemporary western art and Tibetan Buddhist symbolism and a refuge for contemplation in an otherwise busy metropolitan capital. This was followed by a reception during which the members of Team Tibet were honoured with ceremonial Tibetan silk scarves, gifts, and a symbolic souvenir medal to commemorate their historic achievement. The players, coming from mainly Tibetan settlements in India, mentioned that they felt determined to make the most of the chance to play at the highest level of their sport. They have a busy schedule ahead with training sessions and matches complemented by warm hospitality extended by Tibetans and Tibetan organisations in UK to ensure they have an enjoyable stay.